This is not a vendor or product endorsement, but I saw one of these video collaboration devices in action today and wanted to share. It is a Polycom CX5000 and it does 360 degree panoramic group video conferencing (in conjunction with Microsoft Live Meeting 2007 and Microsoft Office Communications Server 2007). 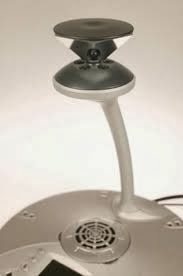 The head at the top of the Polycom is a series of cameras and mirrors that takes the video and it can automatically change the camera view to whoever is speaking. The integration of the voice and video in this unified conference station was functional and fun. Here are some amazing photographs from Yann Arthus-Bertrand. This is someone who can truly see the bigger picture and help us to see it as well. If we can all see beyond the minutia every day, I think we could appreciate the opportunities and challenges before us so much more, and be able to address them more effectively--in perspective. To me, this is the clarity of vision that I aspire to and I hope you do too. Note: This is not an endorsement of any vendor or product, but I thought this short video on enterprise architecture planning and capital planning and investment control/portfolio management was pretty good. I’ve been following the story this week about the 33 miners trapped half a mile below the surface in the collapsed mine in Chile. The story of the miners survival is incredible, but so too are the implications of corporate greed and the neglect of the workers safety and how we treat people as objects rather than human beings. 33 people are stuck in a space approximately 500 square feet for 18 days until a 2.3 inch drill hole was used to discover their whereabouts this week. The miners had lost on average 22 pounds each and were on rationed peaches, milk, tuna, and crackers every other day. The pictures of the miners and the notes of love and hope that emerged from below the earth’s crust were truly inspiring, despite the way that they got trapped to begin with. Yet, the miners now have to wait approximately 4 months for a rescue tunnel 26 inches wide to be completed to pull them to safety. The fear, panic and duress of being trapped 2300 feet down in 95-degree heat in close quarters for so long is something government officials, psychologists, and family members are very concerned about. They have even reached out to NASA to help them deal with the effects of the prolonged isolation. Amazingly, when we think about how technology could help in this situation, it is not necessarily a “super-duper” drill able to dig them out in hours or minutes that is the focus here or a transporter able to beam the miners up the surface in seconds, but rather a simple tool like a ladder placed near the ventilation shaft (as was supposed to have been for safety purposes) would have enabled the miners to escape to the surface. Now instead of the mining company having done the right thing for its workers to begin with, they are now facing a lawsuit from the families of the trapped miners and potentially bankruptcy. This situation is reminiscent of other companies that put their profits before their workers, like we saw recently with BP that didn’t have a simple safety shut-off valve on the leaking oil well, and now they are funding a $20 billion escrow account to settle claims from the Gulf Coast oil disaster. Plain and simple, it does not pay to skimp on worker safety. More than that, people are not only our most important asset—as has become cliché to say, but the whole point of our interactions at work is to treat each other right. Of course, we need and want to be productive, to improve things, to reengineer business processes, enable them with new technologies, and leave the world better from our work, but to me the true test for us as human beings is to make these contributions to our organizations and missions and at the same time not lose our basic humanity. If the cost of an improvement or promotion is some very real bodies that we must climb over to get there, then I say we are failing the true test before us. We can make the same gains and more by treating people with kindness and compassion—the way we would want to be treated. Let’s not deny anyone a ladder or safety valve or even in the smallest ways mistreat our employees. The test of leadership is how we treat people in accomplishing our goals, and the long-term effects to us from our behavior in this regard are greater than any short-term technology or process improvements we can make by dehumanizing ourselves and hurting others. Putting the Donkey Before the Cart - Or Is He Sleeping Inside? 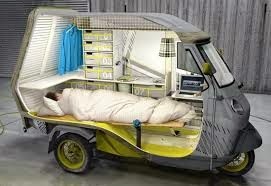 I didn't know whether to laugh or cry when I saw the "Bufalino" mini RV by designer Cornelius Comanns, profiled in DVICE. 3 wheeler. Seats 2. Fold down bed. Fridge. Stove. Sink (basin). Water tank. (Numbered) Storage. And laptop! Nevertheless, I appreciate the need to do more with less, and to create eco-friendly vehicles for the 21st century. I'd like to see Toyota and Chrysler convert their minivans into something with the functionality that this rickshaw was trying to get at. Who knows if Comanns is on to something with this? I just discovered the Ciclotte stationary bicycle. You may have to take a double take before the bulb goes on and you even recognize the bicycle features--then the seat, the pedals, the handle bars come together in this innovative design by Luca Schieppati. 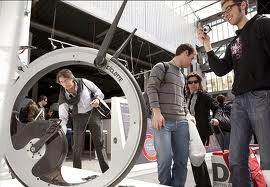 According to Wired Magazine (Sept. 2010), the concept design for this bike sits in the Milan Design Museum. The bike is made almost entirely from carbon fiber and the pedals spin the main wheel that "generates a magnetic field and plenty of thigh-burning resistance." I''ll need to start saving up the $10,700 to own own of these beauties. Technology speaking, I think the picture speaks a thousand words. Check out these and other social media learning resources, policies and procedures, discussion forums and more at the Department of Defense (DoD) Social Media Hub. Traditionally, the IT market has been deeply fragmented with numerous vendors offering countless of products and IT leaders have been left holding the proverbial bag of varied and mixed technologies to interoperate, integrate, optimize, and solve complex organizational problems with. While competition is a great thing in driving innovation, service, and cost efficiencies, the results of the current fragmented IT market has been that organizations buy value or best of breed technologies from across the vendor universe, only to find that they cannot make them work with their other IT investments and infrastructure. The result has been a contribution to IT execution that has become notorious for delivering an 82% project failure rate as reported by the Standish group. Typically, what follows numerous attempts to resuscitate a code blue IT project is the eventual abandonment of the investment, only to be followed, by the purchase of a new one, with hopes of doing it “right” the next time. However, based on historical trends, there is a 4 out of 5 chance, we run into the same project integration issues again and again. 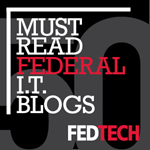 Oracle and other IT vendors are promoting an integration strategy to address this. Overall, Oracle’s integration strategy is that organizations are envisioned to “buy the complete IT stack” and standup “engineered systems” more quickly and save money than if they have to purchase individual components and start trying to integrate them themselves. Some examples of this are their Exadata Storage Servers and Fusion Applications. Oracle is not the first company to try this integration/bundling approach and in fact, many companies have succeeded by simplifying the consumers experience such as Apple bringing together iTunes software with the iPod/iPad/Mac hardware or more generally the creation of the smartphone with the integration of phone, web, email, business productivity apps, GPS, games, and more. Similarly, Google is working on its own integration strategy of business and personal application utilities from Google Docs to Google Me. Of course, the key is to provide a sophisticated-level of integration, simplifying and enhancing the end-user experience, without becoming more generally anticompetitive. On the other hand, not all companies with integration strategies and product offerings are successful. Some are more hype than reality and are used to drive sales rather than actually deliver on the integration promise. In other words, just having an integration strategy does not integration make. For the IT leader, choosing best of breed or best of suite is not an easy choice. We want to increase capabilities to our organizations, and we need a solutions strategy that will deliver for our end users now. 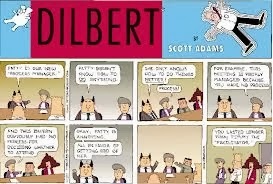 While an integration strategy by individual companies can be attractive to simplify our execution of the projects, in the longer-term, cloud computing offers an alternative model, whereby we attach to infrastructure and services outside of our own domains on a flexible, as needed basis and where in theory at least, we do not need to make traditional IT investment on this scale at all anymore. In the end, a lot of this discussion comes down to security and trust in the solution/vendor and the ability to meet our mission needs cost-effectively without a lot of tinkering to try to put the disparate pieces together. Emergency Management Magazine (July/August 2010) has an article called “Life Savers” that describes how a convergence of new technologies will help protect and save first responder lives. These new technologies can track first responders’ location (“inside buildings, under rubble, and even below ground”) and monitor their vital signs and send alerts when their health is in danger. The key is that none of the individual technologies alone can solve the problem of first responder safety. Instead, “All of those have to be pulled together in some form. It will have to be a cocktail solution,” according to the Department of Homeland Security (DHS), Science and Technology (S&T) Directorate that is leading the effort. Aside from the number of technologies involved in protecting first responders, there is also the need to integrate the technologies so they work flawlessly together in “extreme real world conditions,” so for example, we are not just monitoring health and location at the scene of an emergency, but also providing vital alerts to those managing the first responders. This involves the need to integrate the ability to collect inputs from multiple sensors, transmit it, interpret it, and make it readily accessible to those monitoring the scene—and this is happening all under crisis situations. The most substantial progress to the end-user is not made from lone, isolated developments of technology and science, but rather from a convergence of multiple advances and findings that produce a greater synergistic effect. For example, it clearly takes the maturity of numerous technologies to enable the life saving first responder solution envisioned. Moreover, distinct technical advances from the R&D laboratory must be integrated into a solution set that performs in the real world for the end-user; this is when product commercialization becomes practical. In the case of the first responder, equipment must function in emergency, all hazard conditions. And finally, to bring the multiple technologies together into a coherent end-user solution, someone must lead and many parties must collaborate (often taking the form of a project sponsor and an integrated project team) to advance and harmonize the technologies, so that they can perform as required and work together seamlessly. In the case of the first responder technology, DHS S&T took the lead to come up with the vision and make it viable and that will save lives in the future. I am not endorsing any vendor or product, but here's an impressive video on what Recorded Future is doing with what they call a "Temporal Analytics Engine" to analyze open source information on the web as well as structured data sources. This goes way beyond search as we do it today--this is a look into the future of iterative search, link analysis, information visualization (both temporally and spatially), and predictive analytics. The video shows an example of how the technology can be used in counterterrorism efforts to "connect the dots" on the bad guys and protect our nation and its people. Envision many other applications across government (including law enforcement), business, academia...check it out.